In Naxos Island, only 30 metres from the beautiful sandy beach of Saint George and at a very convenient point, Hotel Galini is one of the most hospitable accommodations of the area. 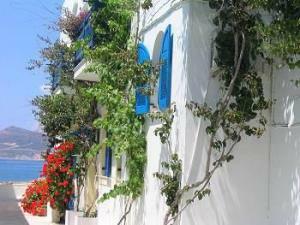 It is right next to all amenities, 300 meters from Naxos Town center and a few meters away from the beach. The hotel is built according to the island architecture standards, with a touch of blue on white. Just enough to make you feel you are in a Greek Island. Bar, 24-hour Front Desk, Free Parking, Luggage Storage, Gay Friendly, Breakfast Buffet. Dry Cleaning, Internet Services, Car Rental, Wi-Fi / Wireless LAN, Free Wi-Fi Internet Access Included.